We all remember the dog pound from Disney’s “Lady & the Tramp”, the dog catchers portrayed as evil with their catch poles crawling about in their cage van searching for dogs to catch and take back like it was their hobby. A dark and dingy place full of dogs in cold kennels looking sad, lost and alone. The little brown mutt too sad to sing who was crying always made me cry as a child. But having been in the animal industry for 13 years now, i know that the reality of UK dog pounds somewhat brighter, (thank goodness). Dog wardens in the UK are mostly people who actually adore dogs and want to be first on scene to respond and ensure each animal is treated with dignity and love. They don’t have time to be hunting down hiding doggies to make up their numbers; the kennels are already crammed and the calls keep coming in about stray and dumped dogs. I have also found that dog wardens are very active in the Lost & Found pet world to try and reunite any of their charges with their families outside of their work hours on their own time, and failing this, they are extremely active in the rescue world, seeking out pound pulling organisations and rescue back ups to take the dogs in when their 7 days are up. So what are our pounds actually like? Well think of the bottom end of the scale of boarding kennels and you’re pretty much there. UK country dog pounds are a council service or contracted purely for council dog warden intake, and therefore do not often have the biggest resources to be refurbishing their premises or improving their resources. Time is the biggest problem, the staff are usually spread thin keeping a full kennels clean and sanitary with feeding times and daily walks. Luckily, many pounds have volunteers who come in to walk dogs, spend time playing and being affectionate as well as helping to train out any behavioural issues. Unfortunately, like everything in life, there are pounds who try to make profit from their rehoming services by selecting certain breeds of dog deemed more adoptable to extend their time in the kennels and put other breeds (like the staffy) to sleep without hesitation. Pounds can also be difficult when dealing with rescues trying to pull dogs from death row. Most pounds also won’t work with any rescue that publicly states a dog has been on death row, it says it gives the dog warden service and that particular “rehoming centre” a negative connotation. Posing as a rehoming centre and not allowing true no-kill rescues to be more honest and open about the problem is meaning their is little to no public awareness of the 18 dogs a day issue in the UK. So is their really a clock ticking? Yes. Once admitted into the kennel and found to have no chip or not be able to contact the owners or have the dog released to the kennel by the owners; the dog has 7 days to be claimed or bought from the pound. Once the 7 days are up, it is all down to how full the kennels are as to how much extension each dog will get. 99% of the time, the pounds are full. If no rescue steps forward to pull an un-“adopted” dog from death row, the dog will be euthanised via lethal injection. Put to sleep. Killed. Call it a rehoming centre, a county kennel or a high kill shelter; the pound represents the stray, abandoned, dumped, unwanted dogs of the UK being turned away by large rescues due to their breed and smaller rescues are too full to help. The 18 dogs a day in the UK being killed. Dog Death Row…Yes; It’s A Real Thing. If you haven’t seen the brutal yet underground documentary “Death Row Dogs”on Netflix yet, i suggest you take a peep to catch just an edited glimpse of the UK’s dog death row situation. The documentary focuses on those dogs who have been reported as “dangerous” to police and are seized for genetic and behavioural testing. 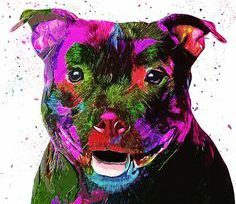 In the UK, should a neighbour or family spat turn sour, no longer is it just the social services being falsely called with reports of addresses to inspect; now your Staffy could be reported for being dangerous or suspected “pit type”. The police must respond to every report, and the manner in which they respond is truly quite horrific and needs some serious revision. Picture a team of 5-10 officers dressed in full riot gear bursting through your front door 10pm at night, shouting, brandishing shields and acting like they’re searching for Osama Bin Laden. You’re dog is separated from you, barking in fear trying to protect you and itself, as they corner it, catch pole in hand. Looped and tightened, you watch screaming in protest as they drag your poor dog down the stairs, out the front and into a dog van where they slam the door shut as if your loving family pet is an alligator. Where is your dog going? To a concrete kennel block to be kept in isolation for “observation” and DNA testing to determine what percentage is Pit Bull and whether your dog is friendly or not… Disorientated, confused, defensive and with negative connections to these people manhandling them, being kept in quarantine with minimal human contact; what chance does any dog have of passing the test? How would you be affected after 6 months in isolation; could you interact normally? Even if your dog passes this emotional and mental mountain, should it be more than 20% pit bull DNA, it will be euthanised any way. Because of it’s breed. Nothing else. What world are we living in where a country calls itself an “Animal Loving Nation” yet turn the other cheek to such a horrific system that puts healthy and happy dogs to sleep simply because of their type, or in human terms; race? The UK classes itself as having the best animal rights legislation’s in the world, yet we allow the system to try our canine family members in court because of their heritage, this would be the same as determining without any biological proof that all white people are criminals because of their skin. Support our work pulling dogs from UK death-rows, rehabilitating and rehoming them via online donation through PayPal “Friends & Family” to: broken-soulsrescue@outlook.com or visit http://www.broken-souls-rescue.org. Buster is 10 years old and i have no idea where he has been, what he has seen or how he came to be on deathrow. He has the goofiest face you just want to laugh at and all he wants to do is cuddle up and watch TV. Out and about he has been a perfect gentleman with a particularly gentle nature around children and a playful attitude to other dogs and cats. Why is Buster on deathrow with 1 day left until he will be taken down that hall and “put to sleep” with the subtle pink fluid. I will never know why Buster was on deathrow, an unclaimed stray, nor Oliver, or Mitch or Cubey or any of the 100’s of others i see everyday in our rescue, in my email inbox, on my facebook wall all desperately begging me for a rescue space. I can’t save them all, we are a small scale rescue after all, but if ignore that email, that post, that voicemail…where will that dog be tomorrow? How can the UK be so ignorant to not be able to see the severity of this animal overload on the island to continue to breed more puppies and kittens? They will complain about graphic images in social media posts and the never ending plea for donations but they refuse to realise the source: Themselves. Until we stop treating our loyal canine companions like commodities and possessions we can pick up, throw away and replace the problem will not cease. 18. Eighteen. 18 Dogs are euthanised each day UK. Wake Up! Please tweet, post, blog but #18DogsADayUK today. Donate to support our rescue work through PayPal (broken-soulsrescue@outlook.com) or via the website on our contact page.